Tersa is the inventor of the quick-change tools in woodworking: the solid block chisel with a smart wedge clamping system. Made for Tersa reversible blades. Due to the wedge clamping system the chisel blades put themselves stuck in the solid block chisel. What is good, is counterfeited. So here and there various counterfeit blades appear on the market. Do you want to be assured of a high quality? Then choose the one and only Tersa knives, choose Tersa Swiss Made. 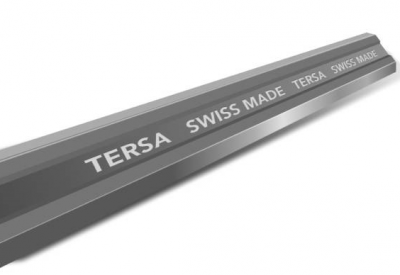 The Tersa brand is one of the brands produced by the Swiss manufacturer SAMVAZ SA. SAMVAZ SA has been around for 50 years and is a professional manufacturer of woodworking products. The brand Tersa existed for over 30 years. Everything originating from Switzerland is good. Not only watches, cheese, chocolate and pocketknives but also our Tersa reversible blades. Tersa stands already for almost 30 years of outstanding Swiss quality. The blades are extremely tough and stay razor sharp for a long time. The power lies in the hard top layers, the grinding quality and fit. In the assortment of Tersa there are six different planing blades. With the Tersa CR, T1, HSS, M+, Gold or TC you can master any type of wood. No matter with what kind of blade you work: a Tersa blade cuts like a hot knife through butter. Finally is Tersa also known for its fast delivery times. Since when your current blade needs replacement, you want another Tersa blade as quickly as possible, right? Learn more about our possibilities? Please feel free to contact us.